Our current services include all aspects of painting, plastering, wallpapering, colour matching and painting consultancy for both residential and commercial properties. We maintain a database of all clients specifications. If in the future the client needs to refer to the database the information will be readily available. This will help lead to a stress free situation wherever maintenance or renovation work is needed to be carried out. 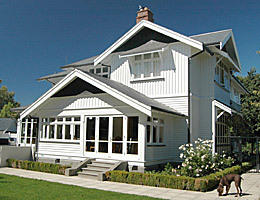 Wisker Contracting recently painted the exterior of our character home in Fendalton, Christchurch.